In support of Horsham District Year of Culture 2019, Saxon Weald are sponsoring a Gruffalo to celebrate the patron of the year, Julia Donaldson CBE, and the 20th anniversary of her famous book, The Gruffalo. The launch took place at Leonardslee Gardens on Thursday 10 January and featured a short performance of the Gruffalo book. Saxon Weald Assistant Director - Customer Experience, Rachel Richards, was lucky enough to join Julia Donaldson on stage and take on the role of the snake! Read more about the launch event here. Saxon Weald's Gruffalo is number eight, and one of just twenty Gruffalo toys that have been sent out on their year long adventure. All twenty are planned to return to Horsham at the end of the year, to be featured in a public exhibition at Leonardslee Gardens in 2020. 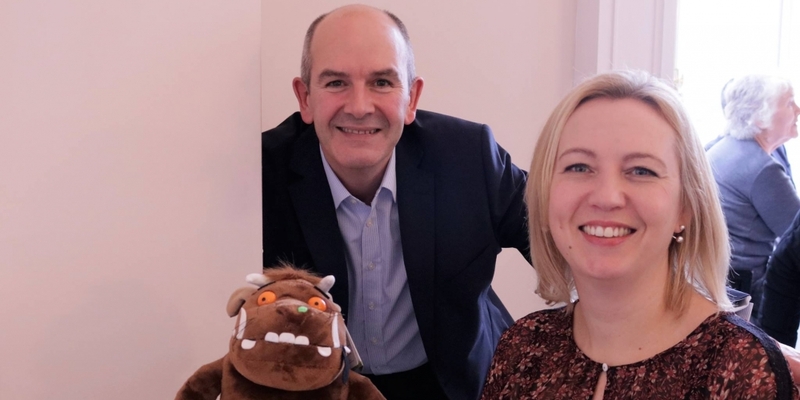 Saxon Weald are proud to be supporting Horsham District Year of Culture 2019 and we look forward to sharing our Gruffalo's journey throughout the year accross our social media channels. Not yet following us? Like our Facebook page by clicking here. More of a Twitter user? Follow us here. For more information on the Global Gruffalo and to keep up with all of their activities visit www.globalgruffalo.co.uk.